Louis de Rouvroy, also known as Duke of Saint-Simon, was a French soldier, diplomat and a noted diarist. He was born 16 January 1675. Saint-Simon began his career in the military, but this was not where his heart lie. After serving in the military for some ten years, he retired in 1702 his commission against his father's wishes, and he ensconced himself into the intrigues of court life. Saint-Simon now spent his time writing, recording as much of the juicy gossip around him as he could manage to put to paper. Apparently he was incredibly prolific in his note-taking. It is worth noting that during his lifetime, Saint-Simon's writing did not achieve much notoriety. But posthumously he has achieved great literary fame. Critics over time have discovered he had great narrative skill and he was very talented in building quite complex characters. His work has been compared to the historical writings of Tacitus and Livy. Additionally, he can be credited for turning the word 'intellectual' into a noun, and he is possibly the creator of words such as 'patriot' and 'publicity'. Saint-Simon died 2 March 1755. 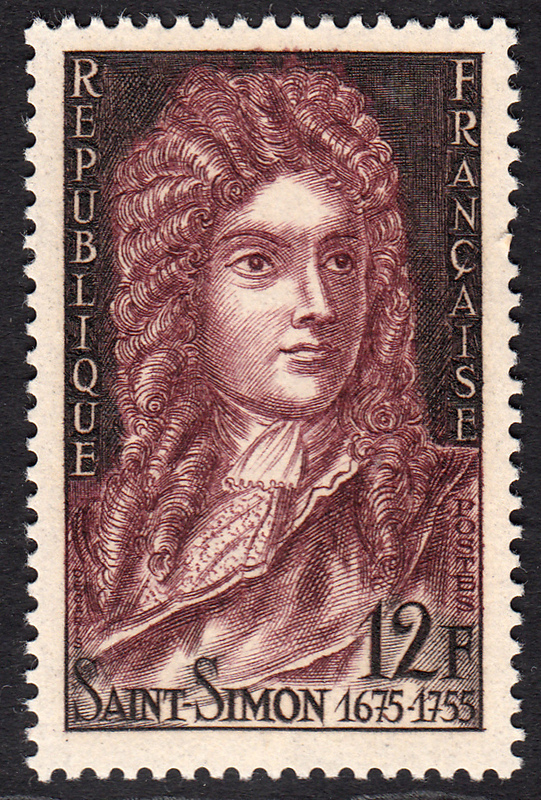 On 7 February 1955, France issued a stamp commemorating the 200th anniversary of the death of Saint-Simon. This stamp was designed and engraved by Albert Decaris. I particularly like the colour choice of of this striking portrait. The dark background serves to highlight the intricate detail of Saint-Simon's hair. The clothing has also been superbly rendered. In conclusion, an excellent portrait of a truly fascinating character.